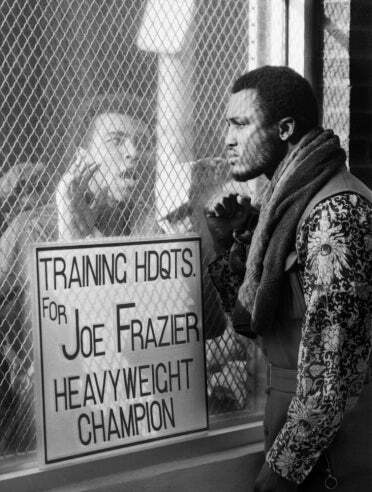 Joe Frazier Was Cooler Than Ali. Discuss. Joe Frazier died two years ago today. Now is as good a time as any to pay tribute to the former champ through a single photograph that best captured the unbridgeable distance between the two premier fighters of the age — a picture made at the very moment when the rivalry between Ali and Smokin' Joe was coming into full, violent flower. LIFE's John Shearer took the photo at Frazier's training camp not long before the March 1971 "Fight of the Century." Seen today, all these years later, the image is so freighted with symbolism that it's hard to believe that Shearer — all of 24 years old at the time — didn't somehow stage it. Separated not merely by glass, but by a wire-mesh window (evocative of the legal battles that had entangled Ali for three long years), the two fighters face one another from mere inches away — and yet seem to reside in wholly different realities. Frazier, the champ, wears a flowery shirt that contrasts mightily with the huge, clenched fist he holds up to the glass. His gaze, meanwhile, casually and devastatingly dismisses his antic challenger. If Ali traveled all the way to Frazier's training headquarters to try and undermine the champ's confidence or rattle his resolve, he clearly journeyed in vain. That Ali's perpetual clowning annoyed the man who wore the heavyweight crown is beyond dispute. But far from knocking the champ off his game, Ali's pre-fight characterizations of Frazier as an "Uncle Tom" and an "ugly gorilla" only served to give Frazier the ammunition he needed to train harder than he'd ever trained for any fight in his life. Boxing might be an abomination. But in the winter of 1971, it was the sharpest lens through which countless sports fans viewed a fraught, divisive era. Ali vs. Frazier wasn't just a title bout; it was a clash of cultures.